So, the 'rents are back from six weeks in Australia: they were doing the grand tour of friends and rellies. And, as is necessary after every trip south, they brought me back all my favourite treats. I'm not ashamed to admit it: Australian lollies are wa-a-a-y better than Canadian ones. Even though we have Cadbury here, there's nothing as perfectly constructed as a Caramello Koala 'round these parts. And there's certainly no biscuit even half as good as a Tim Tam. Maybe it's for the best: I'm a binge eater at the very best of times so you can only imagine what my nutrition has been like this week... I feel happy but ill.
Pictured above, left to right, top to bottom: Lipton and Tetley one cup tea bags (I'm no tea snob. Can you believe we don't have single cup bags here? 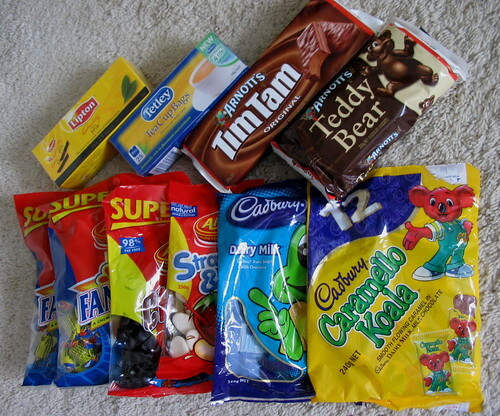 ), Arnott's Tim Tams, Arnott's Teddy Bears, Allen's Fantails, Allen's Chicos, Allen's Strawberries 'n' Cream, Cadbury Freddo Frog and Cadbury Caramello Koala. Not pictured is a large jug of Cottee's raspberry cordial (we don't get cordial here, either!). Click the photo to read my comments on each treat. Check out Freddo's new active lifestyle! 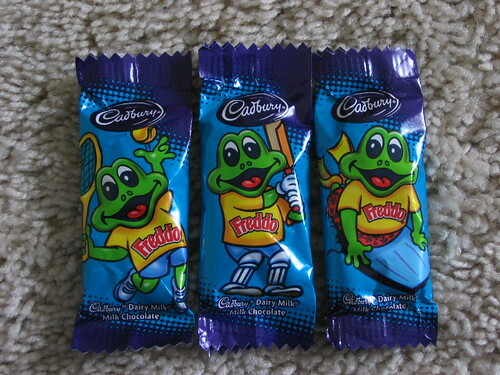 When I was a kid, all Freddo was good for was standing about with his great big mouth hinged open. Well, I suppose that hasn't changed but now he's into all sorts of sporty hobbies. Good for you, Freddo. Doctor's orders, was it? Caramellos and Tim Tams are the best! And I'm very surprised that you don't have single tea bags in Canada. Would love a candy swap, but I have nothing very exciting to send from here! My parent's didn't bring ALL my favourites: I didn't get any milk bottles, pineapples, snakes, frogs, freckles... and I haven't even got into the list of bikkies and other snacks! Still, they had one entire carry-on full of treats, so I did pretty well. there's no single cup tea bag there? i didn't notice! in the states, you can buy generic brand orange pekoe packs, 100 for two dollars. not that i buy it.